Affluent investors, regardless of ethnic background, are generally confident in their financial knowledge and investment acumen. At least one-third of ethnic investors surveyed consider themselves self-directed, meaning they make all of their financial decisions without the benefit of a financial advisor. The highest percentage of affluent Black, Hispanic, and Asian investors are event-driven, meaning they make most of their own financial decisions, but do consult a financial advisor for specific purposes such as saving for college, asset allocation or retirement planning. Almost half (47 percent) of affluent Hispanics identify themselves as such, compared with 43 percent of Blacks and 39 percent of Asians. Affluent Asian investors are more likely than their Hispanic and Black counterparts to identify themselves as self-directed investors (41 percent vs. 36 percent, respectively). When asked why they do not use a financial advisor, nearly half of Blacks (47 percent) said they thought they could do a better job of investing than a professional. Hispanics and Asians expressed less confidence in their financial knowledge and investment abilities at 35 percent each. Affluent Hispanic investors were the most likely (30 percent) to express the wariness that their financial advisor would be looking out for their best interests, compared with 26 percent of Blacks and 25 percent of Asians. 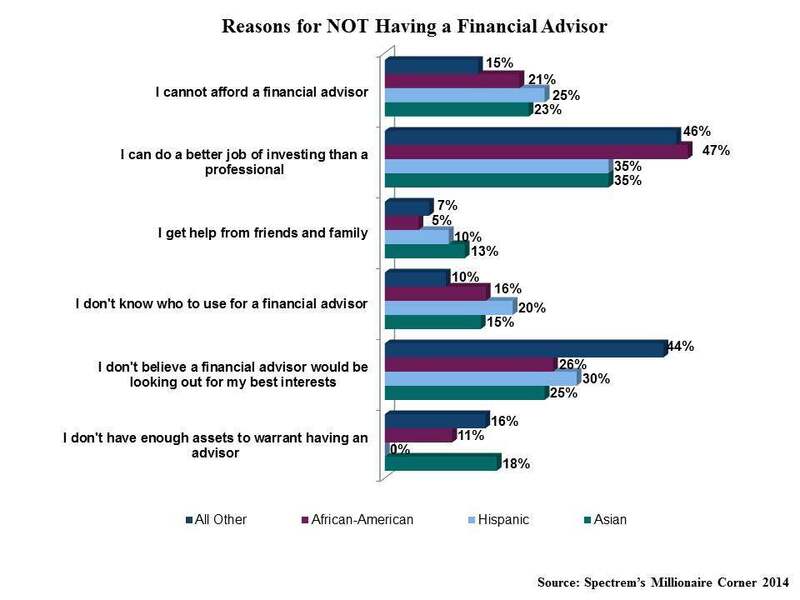 Among affluent Hispanic (25 percent), Asian (23 percent) and Black (21 percent) investors, the third most-cited reason for not using a financial advisor was that they felt they could not afford one. The other most-cited reasons were that these investors said they did not know who to use for a financial advisor or that they felt they didn’t have enough assets to warrant having an advisor. At least 15 percent would consider using a financial advisor if said advisor received a very favorable recommendation from a trusted friend or family member.